As a community, we need to do a better job spreading the word about how important a yearly flu vaccine can be in helping protect kids - and ourselves - from influenza. "Along with all the things that parents know are important for helping keep their kids healthy - like washing hands and getting enough sleep - flu vaccination should be right up there, but this survey shows us that we still have a lot of educating to do," said Anne Moscona, M.D., professor of pediatrics and of microbiology and immunology, and vice chair of pediatrics for research at Weill Medical College of Cornell University. "As a community, we need to do a better job spreading the word about how important a yearly flu vaccine can be in helping protect kids - and ourselves - from influenza." 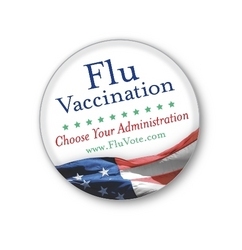 "Flu Vaccination: Choose Your Administration" is an election-themed campaign that aims to empower and encourage Americans to make informed decisions about flu vaccination. As part of the campaign, sponsored by MedImmune, visitors to FluVote can learn more about two of the most important health choices they can make this election/flu season: electing to get a flu vaccination and learning more about flu vaccine options. These surveys were conducted online within the United States by Harris Interactive on behalf of MedImmune between June 4 and June 19, 2008 among 952 U.S. residents ages 24 and older with an 8-17 year old in the household for whom they are the parent or guardian and among 875 U.S. children and adolescents 8-17 years old. No estimates of theoretical sampling error can be calculated; a full methodology is available. Harris Interactive conducts a full range of custom research projects for clients in both commercial and public policy arenas and among children and teens. Harris Interactive's policies on interviewing children and teens comply with the legal codes of conduct in each country in which research is conducted. With regard to online research in the U.S., Harris Interactive complies with the Children's Online Privacy Protection Act. MedImmune is wholly owned by AstraZeneca plc (LSE: AZN.L, NYSE: AZN) and is the worldwide biologics business for the AstraZeneca Group. The company has approximately 3,000 employees worldwide and is headquartered in Gaithersburg, Maryland. MedImmune strives to provide better medicines to patients, new medical options for physicians and rewarding careers to employees. Dedicated to advancing science and medicine to help people live better lives, the company is focused on infection, oncology, respiratory disease and inflammation, cardiovascular/ gastrointestinal disease and neuroscience. For more information, visit MedImmune's website. American, European and Asian offices and a network of independent market research firms. For more information, please visit http://www.harrisinteractive.com. 1 MedImmune. Parent-Child Influenza Survey. Harris Interactive Inc. June 2008. 2 Centers for Disease Control and Prevention (CDC). MMWR. 2008;57(Early Release):1-60. Available at: http://www.cdc.gov/mmwr/preview/mmwrhtml/rr57e717a1.htm. Accessed August 11, 2008. 3 Centers for Disease Control and Prevention (CDC). Key Facts about Influenza and the Influenza Vaccine. Available at http://www.cdc.gov/flu/keyfacts.htm. Accessed August 11, 2008. 4 Centers for Disease Control and Prevention (CDC). Questions & Answers: Cold Versus Flu. Available at http://www.cdc.gov/flu/about/qa/coldflu.htm. Accessed August 11, 2008.